Composite Industrial Mats - Heavy Duty Mat | Newpark Resources Inc.
DURA-BASE® Advanced-Composite Mats are the original, against which all other composite mats are measured. DURA-BASE® IS LESS COSTLY TO MAINTAIN. Some competitive products comprise multiple pieces held together with over 100 metal fasteners. DURA-BASE®’s single-piece, non-absorbent sealed construction prevents absorption of contaminants, water and foreign debris into the mat, which makes many competing mats heavier and more expensive to maintain. DURA-BASE® IS A PROVEN INVESTMENT. Newpark has over 50 years in the matting business, and over 20 years of experience with heavy-duty advanced composite mats, more than any other manufacturer. DURA-BASE® has the largest fleet of heavy-duty advanced composite mats. 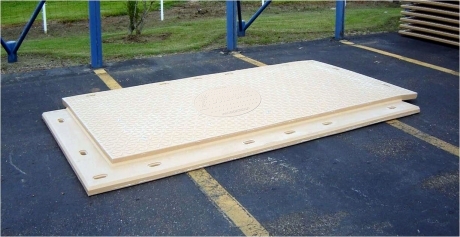 DURA-BASE® mats have proven to be long lived as advertised with many of the original mats still in service today. Single-piece, sealed construction cannot be breached, and so protects the spill management liner from premature failure, and provides the foundation for an effective spill management system in eco-sensitive areas. DURA-BASE®features a patented connection system that interlocks on all four sides, which eliminates differential movement, preventing load destabilization and creating a safe, continuous temporary work surface. DURA-BASE® has a specially-designed tread pattern and anti-skid surface material that prevents slips, and improves pedestrian and vehicle traffic. Made of a specially designed advanced-composite formulation, DURA-BASE® will not absorb and is not reactive to a wide range of chemicals and substances. Proven to last 15+ years of service, repairable, and recyclable. Active recycle and buy-back program supports sustainability initiatives.